The proliferating cell nuclear antigen (PCNA or PCN-1 in C. elegans), an essential processivity factor for DNA polymerase δ, has been widely used as a marker of S-phase. In C. elegans early embryos, PCN-1 accumulation is cyclic, localizing to the nucleus during S-phase and the cytoplasm during the rest of the cell cycle. The C. elegans larval and adult germline is an important model systems for studying cell cycle regulation, and it was observed that the cell cycle regulator cyclin E (CYE-1 in C. elegans) displays a non-cyclic, continuous accumulation pattern in this tissue. The accumulation pattern of PCN-1 has not been well defined in the larval and adult germline, and the objective of this study was to determine if the accumulation pattern is cyclic, as in other cells and organisms, or continuous, similar to cyclin E.
To study the larval and adult germline accumulation of PCN-1 expressed from its native locus, we used CRISPR/Cas9 technology to engineer a novel allele of pcn-1 that encodes an epitope-tagged protein. S-phase nuclei were labeled using EdU nucleotide incorporation, and FLAG::PCN-1 was detected by antibody staining. All progenitor zone nuclei, including those that were not in S-phase (as they were negative for EdU staining) showed PCN-1 accumulation, indicating that PCN-1 accumulated during all cell cycle phases in the germline progenitor zone. The same result was observed with a GFP::PCN-1 fusion protein expressed from a transgene. pcn-1 loss-of-function mutations were analyzed, and pcn-1 was necessary for robust fertility and embryonic development. In the C. elegans early embryo as well as other organisms, PCN-1 accumulates in nuclei only during S-phase. By contrast, in the progenitor zone of the germline of C. elegans, PCN-1 accumulated in nuclei during all cell cycle stages. This pattern is similar to accumulation pattern of cyclin E. These observations support the model that mitotic cell cycle regulation in the germline stem and progenitor cells is distinct from somatic cells, as it does not heavily rely on cyclic accumulation of classic cell cycle proteins. Regulation of cell proliferation is key to a wide range of health concerns, from infertility to wound healing and cancer. Like Goldilocks, every tissue in every living organism must find the level of cell division that is “just right” in order to survive, develop, and pass on genetic information. The cell cycle coordinates duplication and segregation of both genetic and cellular material to two daughter cells. Cell cycle regulators change abundance or localization at different stages of DNA replication and cell division. For example, cyclin E accumulates during the G1-S-phase transition. This pattern is generally conserved between multiple eukaryotic kingdoms of life. However, the adult C. elegans germline accumulates cyclin E in all cell cycle phases, suggesting that this tissue may utilize distinctive mechanisms of cell cycle control . The distal C. elegans hermaphrodite germline contains the only stem cells in the adult C. elegans (Fig. 1a). The somatic distal tip cell (DTC) surrounds the syncytial distal-most nuclei and provides the niche to maintain these stem cells in their proliferative fate. The ~ 20 cell-diameter long distal region, which includes the mitotically cycling germline stem and progenitor cells and meiotic S-phase cells but not cells in meiotic prophase, is called the progenitor zone [2–5]. As germ cells move away from the DTC, the cells finish the mitotic cell cycle, enter the meiotic cell cycle, undergo meiotic S-phase, and enter prophase I of meiosis . The proliferating cell nuclear antigen (PCNA or PCN-1 in C. elegans) is an essential processivity factor for DNA polymerase δ (Reviewed in ). As its name suggests, PCNA was identified by its nuclear accumulation in proliferating cells . In mammals, antibody recognition of PCNA is an often-used technique to identify cells in S-phase . Brauchle et al. established PCN-1 as a useful in vivo marker of S-phase in C. elegans early embryos, a stage when the cell cycle involves only negligible gap phases. In transgenic worms that express a green fluorescent protein GFP::PCN-1 fusion protein under the control of the pie-1 promoter, GFP::PCN-1 localizes to the nucleus during S-phase, resulting in a bright fluorescent signal. At nuclear envelope breakdown (beginning of mitosis), GFP::PCN-1 localizes to the cytoplasm, resulting in a diffuse, low level signal. Similarly, GFP::PCNA protein injected into the gonad serves as a marker of S-phase in both C. elegans pronuclei and early embryonic divisions . For studies of cell cycle dynamics in the C. elegans adult germline, labeling with nucleotide analogs such as 5-ethynyl-2′-deoxyuridine (EdU) or 5-bromo-2′-deoxyuridine (BrdU) has been the gold standard to identify S-phase [1, 2]. However, these chemicals must enter C. elegans by feeding or soaking, which limits the utility of this approach. For example, some older adult animals fail to label with EdU following a short (e.g. 30 min) exposure, which might reflect defects in ingestion and/or transport of EdU (, our unpublished observations). To clarify the relationships between PCN-1 accumulation and nucleotide analog incorporation as markers of S-phase, we developed methods to combine these two approaches. To visualize PCN-1 in the adult germline, we used CRISPR/Cas9 genome editing to modify the native pcn-1 locus to encode a 3xFLAG epitope at the N-terminus of PCN-1. Surprisingly, FLAG::PCN-1 accumulated in all nuclei in the germline progenitor zone. By contrast, a short pulse of EdU revealed that only about half of these nuclei were in S-phase. 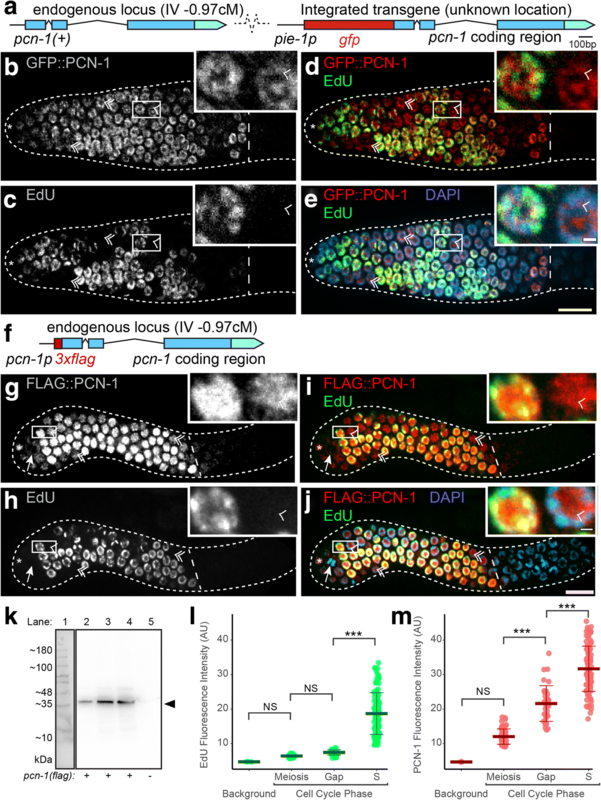 These results suggest that the accumulation and localization of PCN-1 is regulated differently in the C. elegans germline, where it is present in all progenitor zone nuclei, compared to the embryo, where it is restricted to nuclei in S-phase. Furthermore, we demonstrated that pcn-1 is an essential gene in C. elegans necessary for both adult fertility and embryonic development. These results extend the understanding of the accumulation and function of PCN-1 in C. elegans, an important model system for studies of germline development and cell cycle regulation. C. elegans strains were maintained at 20 °C on 6 cm dishes of nematode growth media (NGM) seeded with OP50 E. coli . The wild-type strain was Bristol N2. The GZ264 strain contains the GFP::PCN-1 transgene (isIs17) inserted at an undefined location in the genome, and it is wild-type at the pcn-1 locus . To engineer a FLAG epitope tag into the endogenous pcn-1 locus, we used the co-CRISPR approach . The injection mix contained Cas9-expressing pDD162 (gift from Mike Nonet) at 50 ng/μl, dpy-10 guide plasmid (pMN3153) at 20 ng/μl, dpy-10(cn64) ssDNA repair template AFZF827 at 500 nM, pcn-1 guide plasmids (pZK21 and pZK23) at 40 ng/μl for each plasmid, and a ssDNA repair template (ZK071 containing the 3xflag sequence) at 600 nM. We injected the gonads of P0 wild-type hermaphrodites, selected F1 progeny that displayed the Rol phenotype, and used PCR to select animals with the desired genotype. Two independently derived strains contained the same insertion of the 22 amino acid coding region for the 3xFLAG epitope after the initial methionine codon of pcn-1. We named these alleles pcn-1(am315) and pcn-1(am316) (strains WU1764 and WU1765, respectively). We used a GFP-tagged balancer chromosome to maintain the strain pcn-1(am315)/nT1g due to the observed maternal-effect lethal phenotype. To confirm expression of the full-length FLAG::PCN-1 product, we performed a Western blot. In brief, animals were washed from one 12 cm NGM dish and rinsed 4 times with M9 buffer. Protease inhibitor (Thermo Scientific Pierce Protease Inhibitor Mini Tablets Cat# 88665) was used at 2× listed concentration in the second two washes. An equal volume of 2× lysis-and-loading buffer (100 mM TrisHCl pH 6.8, 200 mM DTT, 4% SDS, 0.2% Bromophenol Blue, 20% Glycerol) was added, and the samples were frozen at − 80 °C overnight. The samples were microwaved, boiled, sonicated in an ice bath, and boiled again. Samples (1.5, 7.5, or 15 uL) and a size reference (7uL, AccuRuler Prestained Protein Ladder LambdaBio Cat# G02101) were loaded into a pre-cast gel (BioRad Mini-PROTEAN TGX 4–20% polyacrylamide gel Cat#456–1093) in 1X Tris/ Glycine/ SDS buffer and run at 180 V for ~ 1 h in an ice bath. Samples were transferred to activated membrane (Millipore Immobilon-P) in 1X Tris/ Glycine/ 20%Methanol buffer at 350 mA for ~ 1 h in an ice bath. The membrane was incubated in blocking buffer (5% non-fat milk in 1X PBS + 0.5% Tween-20) for ~ 1 h at room temperature with agitation. Primary mouse-anti-FLAG antibody (Sigma M2 F-1804) was diluted 1:10,000 in blocking buffer and applied overnight at 4 °C with agitation. The membrane was rinsed 3× with PBSTw. Secondary anti-mouse HRP antibody (Cell Signaling) was diluted 1:2000 in blocking buffer and applied for ~ 1 h at room temperature with agitation. The membrane was rinsed 3× with PBSTw, incubated with substrate (ThermoScientific SuperSignal West Femto Maximum Sensitivity Substrate) for ~ 1 min, and imaged on a ChemiDoc imaging system. Protein size was estimated from conceptually translated DNA sequence using the Science Gateway Protein Molecular Weight Calculator (http://www.sciencegateway.org/tools/proteinmw.htm). To visualize both FLAG::PCN-1 accumulation and cells in S-phase, we cultured fourth larval stage (L4) and young adult progeny of heterozygous pcn-1(am315/+) parent animals on EdU-labeled E. coli MG1693 for 30 min and promptly dissected . Animals were fixed with 3% paraformaldehyde for 10 min and post-fixed in 100% methanol at − 20 °C overnight. Primary mouse-anti-FLAG antibody (Sigma M2 F-1804) was diluted 1:1000 and rabbit-anti-WAPL antibody (Novus 49300002) was diluted 1:20000 in 30% goat serum and applied overnight. Secondary goat-anti-mouse-Alexa-647 antibody and secondary goat-anti-rabbit-Alexa-594 antibody (Life Technologies) were diluted 1:400 in 30% goat serum and applied for 4 h. The Click-iT EdU Fluor 488 reaction was performed according to manufacturer instructions (ThermoFisher Cat#C10350). Animals were mounted in Vectashield + DAPI on agarose pads and imaged using a 63×/1.4NA Plan Apo oil immersion objective on a Zeiss Observer Z1 inverted microscope equipped with a Perkin-Elmer Ultraview Vox spinning disc confocal system using Volocity software. Exposure times were 150 ms for EdU, 50 ms for FLAG::PCN-1, and 500 ms for DAPI. Images were processed with Fiji  and Adobe Illustrator. GFP::PCN-1 was visualized as described above, except primary rabbit-anti-GFP (gift from Swathi Arur) and secondary goat-anti-rabbit-Alexa-594 were used (Fig. 1b). To quantify fluorescence intensity, we used the region of interest ROI and Measure tools in Fiji. In brief, a cell was selected in a single plane based on DAPI channel and assigned to S-phase or gap phase based on the presence or absence of EdU. A single ROI was drawn to surround the DAPI signal, and the mean intensity of DAPI, EdU, and PCN-1 was obtained for the ROI. Background intensities of all three channels were very low and comparable, and therefore no background subtraction was performed. Statistical analyses were performed in R  using R studio  and ggplot2 . Data were compared using an ANOVA with Tukey’s Honest Significant Difference post-hoc. All error bars shown in figures represent the mean +/− standard deviation. We determined the genotype and phenotype of animals descended from P0 heterozygous pcn-1(am315)/+ or pcn-1(am316)/+ hermaphrodites. F1 animals were cultured individually for 3 to 4 days from egg. Each animal was observed for viability and fertility. Animals which deposited no eggs on the substrate were dissected to allow unlaid F2 eggs to develop. One to 2 days later, F2 progeny were examined for viability. Genotype was established by performing PCR analysis on individual F1 animals. Hermaphrodites were defined as “fertile” if they deposited one or more eggs on the agar surface that hatched and developed into larvae. Animals were defined as “sterile” if they deposited no eggs on the agar surface, or “dead eggs” if all deposited eggs failed to hatch. Heterozygous animals were fertile and did not display obvious defects when cultured in standard laboratory conditions. The GFP-tagged balancer chromosome nT1g was used to track the pcn-1 genotype in a larger number of animals. For brood size assays, P0 pcn-1(am315)/nT1g males were mated to fog-2(q71) females. The non-green F1 progeny of this cross, pcn-1(am315/+); fog-2(q71/+) were synchronized at the mid-L4 stage, isolated to individual NGM dishes, and moved to fresh dishes every 24 h. Parent animals which fled the dish or died of matricidal hatching were excluded. The F2 progeny were counted ~ 2 days later until the cessation of reproduction. fog-2(q71/+) served as the control. For survival assays (egg-to-larva and egg-to-adult), the identical crosses were performed, and F1 animals were allowed to lay eggs for several hours. These eggs were transferred to a fresh dish and counted 24 h later, the unhatched eggs were counted to estimate the number of larvae, and the adults were counted 48 h later. PCN-1 accumulation has been monitored using an integrated transgene that encodes a GFP::PCN-1 fusion protein (Fig. 2a). In C. elegans early embryos, PCN-1 accumulates during S-phase but not during M phase, indicating that it is regulated during the cell cycle [9, 10]. Thus, we anticipated that PCN-1 would display a similar accumulation pattern in the larval and adult germline. To test this prediction, we monitored S-phase nuclei using a short, 30 min pulse of EdU and we monitored PCN-1 expression with an anti-GFP antibody to detect the GFP::PCN-1 fusion protein (Fig. 1b). The nucleotide analog EdU is used as a selective marker of DNA synthesis as it is incorporated into DNA during S-phase. In the germline, S-phase occurs only in progenitor zone cells, which include the stem cells (Fig. 1a). Consistent with previous publications, approximately 50% of progenitor zone nuclei were EdU positive, indicating that these cells were in S-phase (Fig. 2c) [1, 2, 18]. By contrast, all progenitor zone nuclei were GFP::PCN-1 positive, irrespective of their cell cycle stage (Fig. 2b). Thus, about half the progenitor zone nuclei were positive for both EdU and GFP::PCN-1, indicating that cells in S-phase display nuclear accumulation of PCN-1 (Fig. 2d). However, about half the progenitor zone nuclei were negative for EdU and positive for GFP::PCN-1, indicating nuclei that were not in S-phase, and presumably were in G2, M, or the short G1 phase, also accumulated PCN-1 (Fig. 2d, e). It is notable that the GFP fluorescence signal in the germline displayed extremely low intensity, and we could only detect the GFP::PCN-1 fusion protein with long exposure times for GFP fluorescence in live animals or after staining with anti-GFP antibodies. Two features of the transgenic strain raise the possibility that the accumulation pattern of the GFP::PCN-1 fusion protein may not accurately reflect the accumulation pattern of endogenous PCN-1; (1) fusion to the large GFP protein may affect the accumulation pattern or (2) the transgene uses the heterologous pie-1 promoter and is integrated at a random site in the genome, not the endogenous locus (Fig. 2a). To address these concerns, we used the CRISPR/Cas9 technique to edit the C. elegans genome. We chose the small FLAG epitope tag, reasoning that it is less likely to influence protein behavior than GFP. However, we cannot exclude the possibility that the FLAG tagged protein does not behave identically to the endogenous protein. We inserted coding sequence for three copies of the FLAG epitope tag at the N-terminus of PCN-1 into the native pcn-1 locus (Fig. 2f). Two independently derived strains with the identical insertion were generated, and we named these alleles pcn-1(am315) and pcn-1(am316). The presence of a full-length FLAG::PCN-1 fusion protein was confirmed by performing an anti-FLAG Western blot (Fig. 2k). To monitor the expression pattern, we dissected and immunostained animals using an antibody directed against the FLAG epitope. The antibody staining was performed on the progeny of pcn-1(am315/+) animals, and thus included animals of three genotypes: pcn-1(am315/am315), pcn-1(am315/+) and pcn-1(+/+). While the genotype of each individual was not determined using molecular approaches, we observed that the majority of animals showed the same pattern of FLAG::PCN-1 in the distal germline. Specifically, FLAG::PCN-1 was detected in all cells in the progenitor zone (Fig. 2g). We interpreted these animals as a mixture of pcn-1(am315/am315) and pcn-1(am315/+). Thus, it is likely that pcn-1(am315/am315) and pcn-1(am315/+) animals have a similar pattern of expression. A minority of animals displayed no staining. We interpreted these animals as pcn-1(+/+). Several features of the expression pattern were notable. In metaphase and anaphase nuclei (identified by DAPI morphology), FLAG::PCN-1 signal appeared somewhat diffuse and to surround the chromatin (Fig. 2g). By contrast, FLAG::PCN-1 signal in G1, S, and G2 nuclei overlapped with both chromatin and the nucleolus. Similar to the results described above with GFP::PCN-1, we detected multiple examples of nuclei in gap phase which displayed no EdU incorporation but did display nuclear FLAG::PCN-1 accumulation (Fig. 2g–j). The same accumulation pattern was observed with both pcn-1(am315) and pcn-1(am316) strains. PCNA has been reported to show a punctate nuclear pattern in S-phase of mammalian cells [19, 20]. We did not observe punctate FLAG::PCN-1 staining; it is possible that harsh fixation conditions contribute to the lack of punctate staining. To explore the relationship between PCN-1 expression and S-phase in detail, we quantified the intensity of FLAG::PCN-1 and EdU signal (following a 30 min labeling) in individual distal germline nuclei (Fig. 2l–m). Meiotic prophase cells that are not replicating DNA were used to establish the level of background noise. For EdU, the current gold-standard for S-phase labeling in C. elegans, progenitor zone nuclei either displayed very low intensity signal, similar to background, or substantial signal; we assigned these nuclei to gap phase or S-phase, respectively. By contrast, all of the progenitor zone nuclei displayed FLAG::PCN-1 staining that was higher than background, indicating that all of these cells accumulate the protein. Thus, the presence of FLAG::PCN-1 cannot be used to reliably determine if a cell is in S-phase or gap phase. Cells in S-phase had a higher average level of FLAG::PCN-1 staining than cells in gap phase, but the distributions were highly overlapping: 71% of the true S-phase nuclei and 81% of the true gap phase nuclei (74% of total nuclei) were in the ambiguous range of FLAG::PCN-1 intensity (Fig. 2l–m). Thus, FLAG::PCN-1 appears to be continually present in nuclei, although it accumulates to higher levels during S phase. In the C. elegans early embryo, GFP::PCN-1 shows nuclear accumulation only during S-phase [9, 10]). A limitation of our use of FLAG::PCN-1 is that visualization cannot be performed in live embryos. Thus, our results do not establish the expression pattern of FLAG::PCN-1 in early embryos. By contrast to embryos, our results indicate that in the L4 and adult germline progenitor zone, PCN-1 accumulates throughout the cell cycle and its presence cannot be used as a reliable marker of S-phase (Fig. 3). It is likely that germline PCN-1 is regulated by mechanisms other than degradation/translation and nuclear localization. The GZ264 strain that contains the GFP::PCN-1 transgene (isIs17) and is wild-type at the pcn-1 locus (Fig. 2a) is viable and fertile. Compared to wild-type animals, this strain displayed abnormal, tortuous intestinal morphology after only 2–3 days of adulthood and a higher rate of vulval extrusion. The self-fertile brood size was not different from wild type, but the lifespan was slightly reduced (GZ264 16.6 ± 5.0 n = 60; N2 20.5 ± 5.1 n = 120, Log-Rank Test P = .0000019). These phenotypes could be caused by expression of the GFP::PCN-1 fusion protein, a deleterious effect of insertion of the transgene into the genome at a site of functional significance, or additional background effects. To determine how the insertion of the sequence encoding the FLAG epitope at the pcn-1 locus affected gene function, we analyzed heterozygous and homozygous mutant animals. To rigorously quantify the penetrance of phenotypes, we determined the genotype and phenotype of 31 animals descended from pcn-1(am315)/+ hermaphrodites (Table 1a). Genotype was established by performing PCR analysis on individual animals. Heterozygous animals were fertile and did not display obvious defects when cultured in standard laboratory conditions. Animals homozygous for either pcn-1(am315) or pcn-1(am316) that descended from heterozygous P0 hermaphrodites developed to adulthood and displayed sterility or maternal-effect embryonic lethality (Table 1a). These homozygous mutant animals produced few F2 homozygous embryos. Some F1 homozygous mutant hermaphrodites did not lay any embryos and displayed F2 embryos retained inside the uterus. Other F1 homozygous mutant hermaphrodites deposited a few embryos on the substrate, but these embryos failed to develop. This result was confirmed in an independent experiment (without PCR genotyping) examining 60 F1 progeny of heterozygous P0 animals; 15 of these animals (25%) produced no viable progeny. These results indicate that both pcn-1(am315) and pcn-1(am316) are loss-of-function alleles, and pcn-1 function is necessary to promote hermaphrodite fertility. In addition, pcn-1 appears to have a function early in development that can be maternally rescued, since pcn-1 homozygous mutants derived from heterozygous hermaphrodites develop to adulthood, whereas pcn-1 homozygous mutants derived from pcn-1 homozygous hermaphrodites displayed embryonic lethality. To determine if the pcn-1 mutation causes a dominant effect, we analyzed survival and fertility in heterozygous animals under standard laboratory conditions. Progeny of pcn-1(am315/+) heterozygous mutants displayed the same rates of egg hatching (98%) and survival to adulthood (96%) as progeny of pcn-1(+/+) animals (Table 1b). The self-fertile brood size of pcn-1(am315/+) hermaphrodites was not significantly reduced compared to pcn-1(+/+) hermaphrodites (Table 1b). These results indicate that the FLAG::PCN-1 protein does not interfere with the endogenous protein function and pcn-1(lf) mutations are recessive for the fertility and survival phenotypes. We set out to engineer an endogenous non-feeding marker for S-phase in the C. elegans germline. We chose the gene PCN-1 for this purpose, as it has been used as an S-phase marker in mammals and in the C. elegans embryo. Both the GFP::PCN-1 transgene and our CRISPR-engineered FLAG::PCN-1 allele showed that PCN-1 localizes to the nucleus in all cells in the progenitor zone, regardless of whether the cells are in S-phase or gap phase. Therefore, PCN-1 was not a useful marker of S-phase under our conditions. The localization of PCN-1 to all nuclei in the progenitor zone was similar to the pattern of cyclin E1 (CYE-1) in the C. elegans germline . While this result means PCN-1 is not an S-phase marker, it reveals that the C. elegans germline likely regulates S-phase in an unusual way. No previous publications have described the pcn-1 loss-of-function phenotype. The C. elegans database (WormBase WS257) lists a deletion allele, pcn-1(tm3241) that is predicted to be a loss-of-function mutation. A strain that contains this allele displays a lethal or sterile phenotype, consistent with our findings; however, the pcn-1(tm3241) strain has not been backcrossed, and these phenotypes might reflect background mutations . We found pcn-1(am315) animals showed a maternal-effect embryonic lethal phenotype. While it is unclear whether am315 is a hypomorph or null allele, our results show that pcn-1 is necessary for fertility. We established the nuclear accumulation pattern of PCN-1 in the larval and adult germline by analyzing FLAG::PCN-1 encoded by the native locus and GFP::PCN-1 encoded by an integrated transgene. Both fusion proteins displayed similar patterns and accumulated in all nuclei in the progenitor zone. Significantly, nuclei that were negative for EdU staining, and thus not in S-phase, displayed nuclear PCN-1 accumulation (Fig. 3). Similar results were previously observed for cyclin E accumulation (CYE-1 in C. elegans) . These observations reinforce that mitotic cell cycle regulation in the germline stem and progenitor cells is distinct from somatic cells . The C. elegans proliferating cell nuclear antigen homolog pcn-1 was necessary for robust fertility and embryonic development. Kerry Kornfeld and Tim Schedl contributed equally to this work. We are grateful to Swathi Arur for rabbit-anti-GFP antibodies, the E. coli stock center for MG1693, Wormbase, and the Caenorhabditis Genetics Center which is funded by the National Institutes of Health Office of Research Infrastructure Programs (P40OD010440) for strains, Mike Nonet and Scott Dour for advice, reagents, and microscope use for CRISPR/Cas9 genome engineering, Zach Pincus for injection microscope use, Ariz Mohammad for the balanced strain, Andrea Scharf and James Tan for assistance with Western blot preparation, the Kornfeld and Schedl labs for feedback on this manuscript, and the anonymous reviewers for suggestions that greatly improved the manuscript. This work was supported in part by NIH grant R01 AG02656106A1 to KK, NIH grant R01 GM100756 to TS, and a NSF predoctoral fellowship DGE-1143954 and DGE-1745038 to ZK. Neither the NIH nor the NSF had any role in the design of the study, collection, analysis, and interpretation of data, nor in writing the manuscript. All data generated or analyzed during this study are included in this published article. The genetic reagents used and generated during the current study are available from the corresponding authors on reasonable request. ZK, KK, and TS designed the study. ZK performed experiments and wrote the manuscript. ZK, KK, and TS revised the manuscript. All authors read and approved the final manuscript.